After 17 months in prison camp, during which time his only book was the Bible, Henn returned to Germany with the practical idea of studying chemistry. But there was no money to go to the university. Then a sculptor happened to look at some of the pieces Henn had created in prison camp, saw great promise, and gave him a set of tools. Henn got a job in the workshop of a wood carver, creating copies of works by old masters like Riemenschneider. The idea of sculpting as a career gradually seemed more and more possible. No one in Henns family had ever been an artist (they all belonged to the honorable professions); he had no academic training; and the world around him seemed to have fallen apart. But I was young and carefree, Henn says, carefree enough to marry and open his own studio. Having no formal training as an artist made things difficult. But the timing was right. Many of Germanys churches had been severely damaged during the war. Small commissions began to come in—commissions to replace fingers and hands on ancient statues, or to create ornaments for the bells which were being recast all over Germany (many of the bronze bells in the country had been melted down to supply metal for weapons). Henns maquette of the Cathedrals tabernacle. This small scale model stands about 10 high. Just as his career as a sculptor in wood was beginning to flower—and as his fourth child was on the way—there was a severe setback. In an accident Henn badly injured his left hand, severing the tendons. He was told he could not sculpt in wood or stone for two years. It seemed like the end. 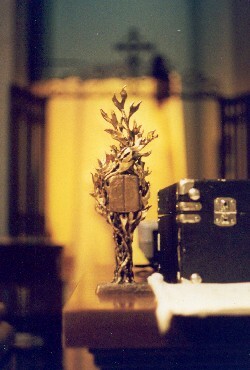 The tabernacle modeled in red wax. What had seemed catastrophic proved to be another major turning-point in his career, for it was in bronze that Henn truly found his handwriting. World famous sculptor Henry Moore described Henns work as melody in bronze. The word aptly suggests the paradoxical lightness, even transparency, of many of Henns works. The greatest pleasure for me is to try to take the heaviness out of the material, Henn says. Sometimes the spaces between speak more than the metal around. Henns sculptures, which include fountains, crucifixes, chandeliers, and some 30 sets of bronze doors, can be found all over Germany. 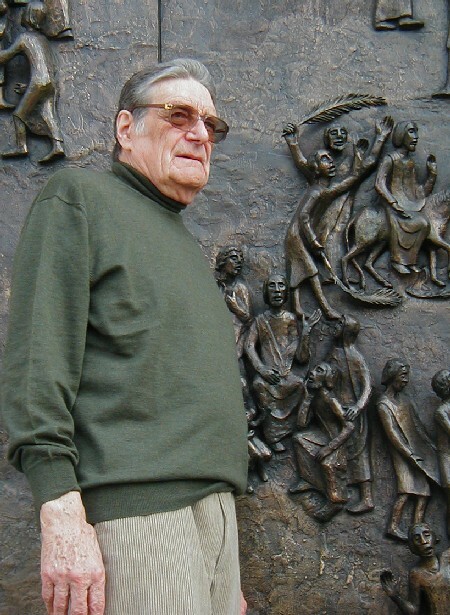 His only work in this country, aside from the doors and tabernacle of St. James, are the great bronze gates of the National Cathedral in Washington, D.C.
An artisan cuts St. James ceremonial bronze doors into pieces for casting. The tabernacle was cast in 16 separate pieces. When he receives a commission, Henn usually has a very clear idea of what he wants to do. His decisions are based both on the function of the work and on the place where the work will end up. A door, for example, is always a point of decision. You can go in or you can stay out. The door should tell what you will find inside. A tabernacle extends an invitation of a different kind. 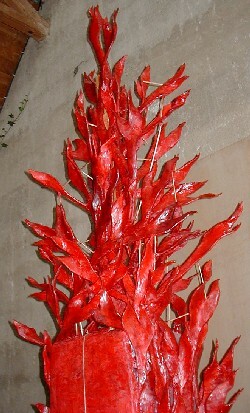 This for me is the place where people fall on their knees, to give their reverence to Christ. Father Ryan suggested the story of the burning bush from Exodus, where Moses, going to investigate the wonder of the bush burning yet not consumed, found himself in the presence of the living God. Henn agreed, and found that the subject was also suited to the space in the cathedral—a very high, narrow room which presented some distinct challenges. 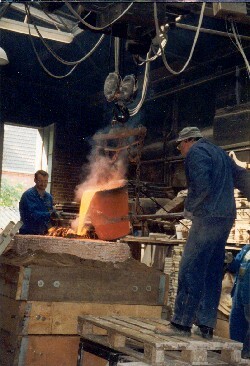 In the foundry, molten bronze (2100° F) is poured into the mold. 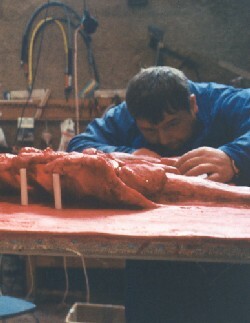 Henns first step was to create a maquette, a small, 1:10 model of the sculpture. He rarely does sketches on paper—I need the third dimension—instead, his studies are done in wax. Many little figures go back to the wax-pot before the sculptor is satisfied with the model. 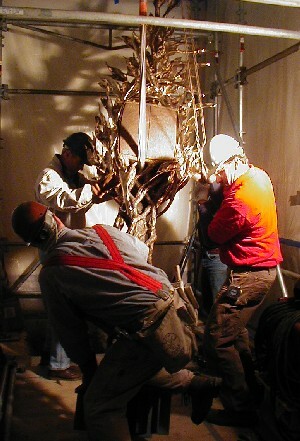 For the Cathedrals new tabernacle, the proportions of the work were so important that Henn flew back to Seattle in September 2001 to look at the Chapel again. By projecting slide images of the maquette on the wall of the Chapel, he was able, with Father Ryan and architect Stephen Lee, to get a very accurate sense of what the proportions of the final work would need to be. The tabernacle is maneuvered into its place in the Blessed Sacrament Chapel. The most time-consuming stage came after the casting and welding were completed. Henn calls it overworking—the process of bringing the textures of the entire work to their finished state. The flames of the Cathedrals tabernacle were burnished to the highest possible polish, work Henn did entirely by hand. Corinna Laughlin is the Assistant for Liturgy at St. James Cathedral.